There are many things you can do before your interview to help your chances. Use capital and lower case letters in your application. Do not write in all lower case (yes, people do this). When you write emails to the school(s), edit your emails well. Be sure you do not write the wrong school name in an email. Slow down and read before hitting send. If the school asks for a photo in the application process, take a nice professional photo. Put on a suit jacket and stand in front of a solid background. They are not looking for creativity here. They really just want to see what you look like (and how professional you are). When you communicate with any person from any school, be kind, professional and appreciative. Assistants have much power in offices. Being rude or hasty on the phone is not ok under any circumstance. They will make note in your application (your name will most likely appear on their caller id). Follow their procedures. Do not ask for a deadline extension. If you missed their deadline, apply the next year. If you are filling out supplemental applications, do not use the same essay for multiple schools. Write each essay specific to that school, highlighting why you would be a good fit. That requires you to know a lot about that school to which you just applied. Go to the location of your interview ahead of time or extra early to find parking, the office location, to deal with luggage and use the restroom. You are going to be stressed enough without worrying about the repercussions of being late. Be early so you can sit, have a coffee and take a deep breath before the day starts. You are always on. Always. From the moment you walk on campus, you are being judged. Be careful about what you say everywhere. Don't go into the bathroom and talk about anything you would not want the admissions committee to hear. Do not talk inappropriately in the breakfast room. Even if the students at lunch or on tour tell you they are not judging, behave as professional as you can. Put your phone away and talk to your peers. If you are sitting and waiting, read their brochures or look for conversation with others. Trust us on this. Jumping on your phone when in a social situation may send the message that you do not prefer to talk to people, which is not what you want to relay when applying to a profession requiring a high degree of human interaction. Shake hands with everyone you meet. Come up with questions. Questions indicate interest, and you should be interested. Be sure to ask the right questions to the appropriate individuals. For example, you would not ask your interviewer about financial aid. Nor should you ask students about admissions practices. Maintain eye contact. If you struggle with eye contact, practice a lot before your interview. Be flexible. If the day doesn't go exactly as planned (an interviewer is late or doesn't show), be ok. If you become overly stressed by an unplanned event, you are letting the admissions staff know how you handle stress. Follow the admissions directions for follow-up communication. Click here to download handout. For example, if they tell you they do not want thank you notes, do not send thank you notes. Most schools will be very clear how they want you to proceed. Listen to them. Some schools will allow updates, while others will not. Know your schools. If they allow updates, space your updates to avoid sending multiple messages in one month. Spread your communication out to remain consistent but not overwhelming. You want them to know your name, but not for the wrong reason. Again, edit your emails very well. The more you send, the more they have to judge. Traditional interviews consist of two to four one-on-one interviews. One of the two interviews will most likely be with a faculty. The other interview may be with a student of admissions officer. Questions can range from "Tell me about yourself" to in-depth questions about specific information in your application. Some traditional interviews are open (the interviewer has your full application), while some are closed (the interviewer knows nothing about you). Sometimes it is partial (parts of your application are missing, such as test scores/GPA). 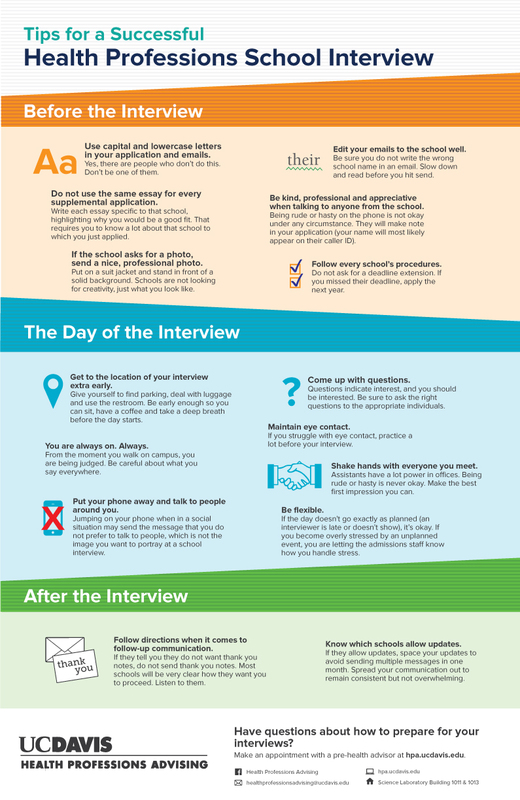 If you are going to a traditional interview, be sure to know your application VERY well. The Multiple Mini Interview (MMI) is an interview format that gauges an applicant’s potential to successfully interact with patients and colleagues. The MMI is designed to measure communication skills, specifically verbal and nonverbal skills that cannot be measured using standardized written exams or by reviewing coursework transcripts. The MMI typically consists of six to 10 very short interviews that revolve around a specific scenario. CASPer Testing: Click here to download slides. - Walk me through a difficult decision your recently made. What factors contributed to your decisions? When should I expect to hear back about interviews? Interview invitations are typically sent 1-2 months after an application is complete. 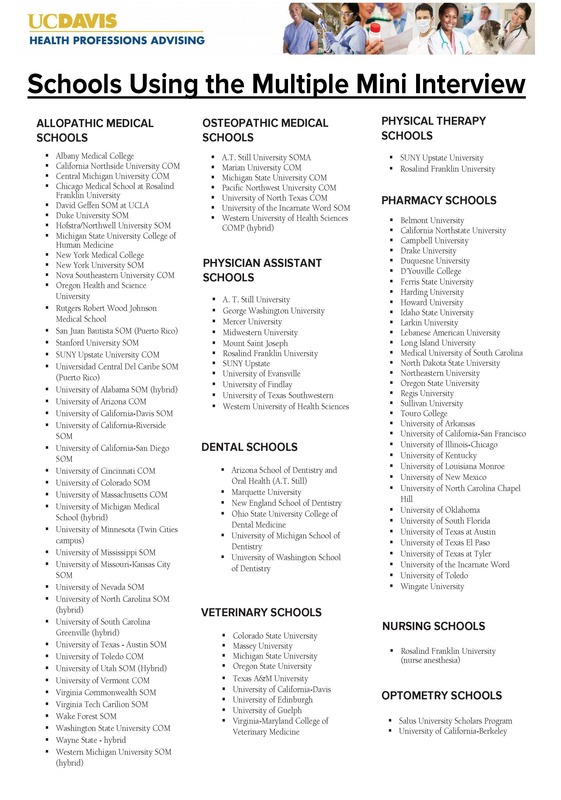 For the majority of health profession programs, this takes place between August and February. Some programs interview in late spring. What are common types of interviews that I should expect? Both the Health Professions Advising and the Internships and Career Center hold interview practice workshops in which students will be given a set of questions and feedback on their responses. The HPA office also holds quarterly mock MMI’s that can be found on our Calendar of Events.